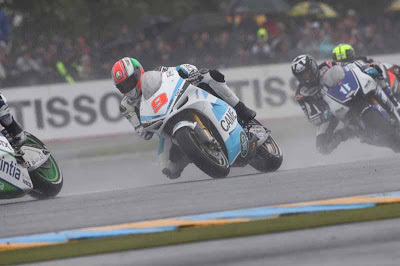 Danilo Petrucci couldn't end the Le Mans race with a good story. An unlucky start for him, his bike was blocked by De Puniet after he crashed. Then Petrucci tried to catch Spies and Abraham, and made his 11th. Pasini was try to take over Petrucci on a few laps before finish line, but denied. Unfortunatelly, Petrucci crashed at the chicane exits. “I’m very disappointed. We were doing a great race but close to the end I have lost the grip to the rear part of my TR003 and I crashed. I did a good pace that permitted to me to get the eleventh position, first of CRTs. Unfortunately in the second half of the race I had a problem with my helmet, there were some fog on the visor and I couldn’t see well the track, thats why Pasini and Ellison reached me. I have to say thank you to my team and Iodaracing for the great work that they are doing, the TR003 here was perfect and we have seen the results on track”.